Just wondering, did they establish if there was evidence that implicated Fisk, as his reason for killing his man? It seems to me the Grand Admiral Thrawn method of handling failed subordinates is probably best - Thrawn would interview his subordinate(s) after a failure and if he determined that the guy was incompetent and not worth salvaging, he would execute them, but if the guy performed to the best of his abilities and actually shows promise in terms of actually improving, he Thrawn will not only spare them, they might even get a promotion. The parts of the Star Wars EU that handled Darth Vader's character better even notes that Vader didn't just kill his people on a whim, he only did it if those people failed for reasons that were in their control. He would let people off if the failure was due to something reasonably unexpected or beyond their control, but he would expect his subordinates to plan for whatever tripped them up next time. Hell, even the Romans figured out punishment for cowardice via decimation wasn't a smart idea and the concept was phased out before the Imperial era. 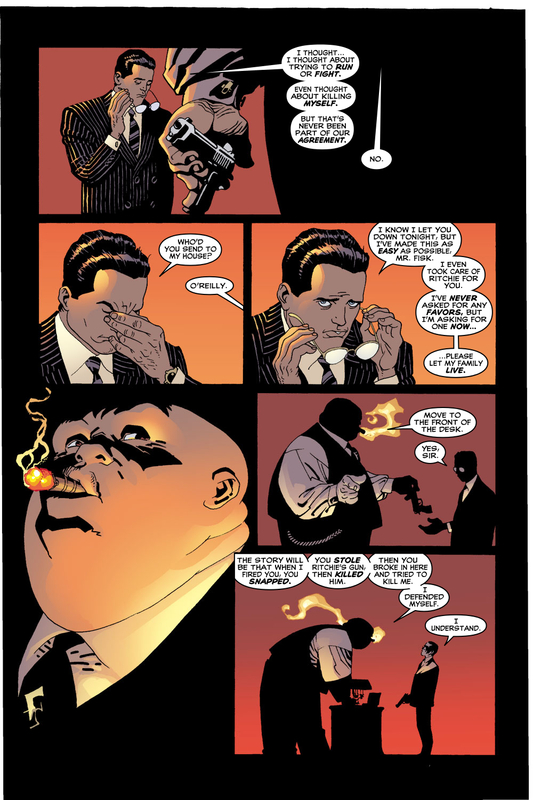 So, yeah, handling the failure of subordinates is something of a weakness of Fisk's. 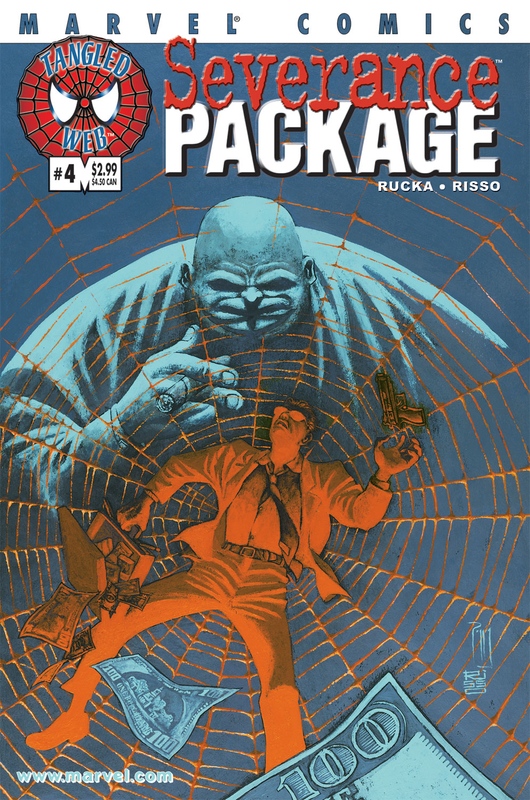 Lots of Daredevil stories would have Fisk killing a subordinate for a perceived slight. One time he killed an underling for using a Latin phrase. 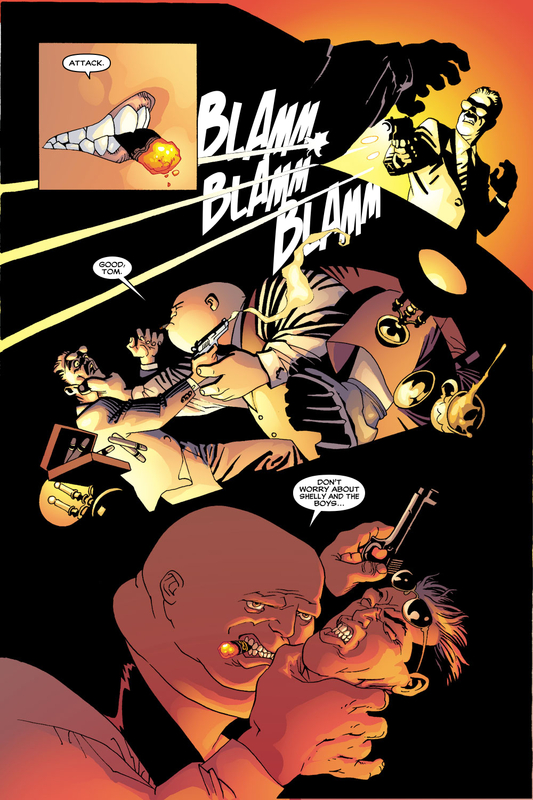 The Netflix version of Fisk killing someone for "embarrassing" him in front of Vanessa isn't *that* different from the comic book Kingpin. 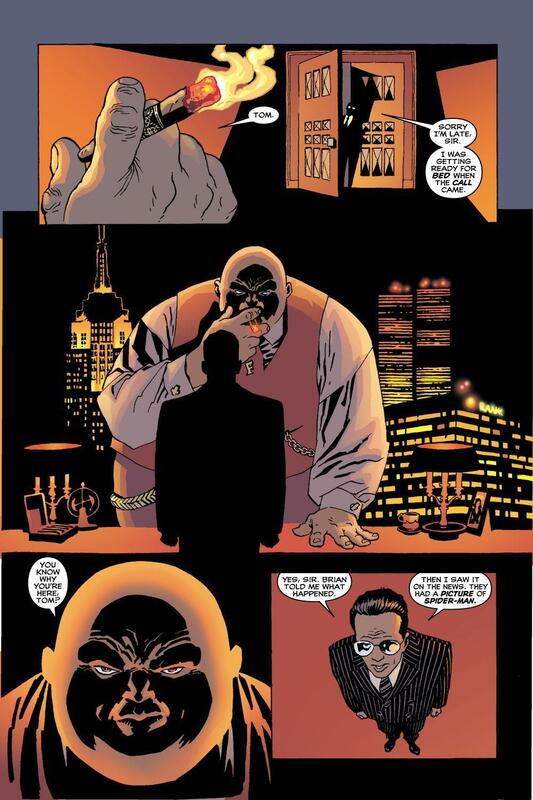 Always one of my favourite Kingpin stories. Love, love, love this. Although...why is Tom wearing those goat-leggings from the Dragnet movie in the first panel? Colour me baffled. It's a towel wrapped around his legs, he just took a shower. This remains one of my favourites for the way Risso completely gets how massive and cumbersome Fisk would be as a human being. He has to use a pen to type in the keys on his phone, for the love a' Pete. Huh... you'd think a guy like that could afford to get a custom made. Still a classic story, but it does feel odd that Fisk would kill perfectly good employees for events beyond their control like superheroes. I mean, with the way that heroes bust plans all the time, he must go through a lot of help. 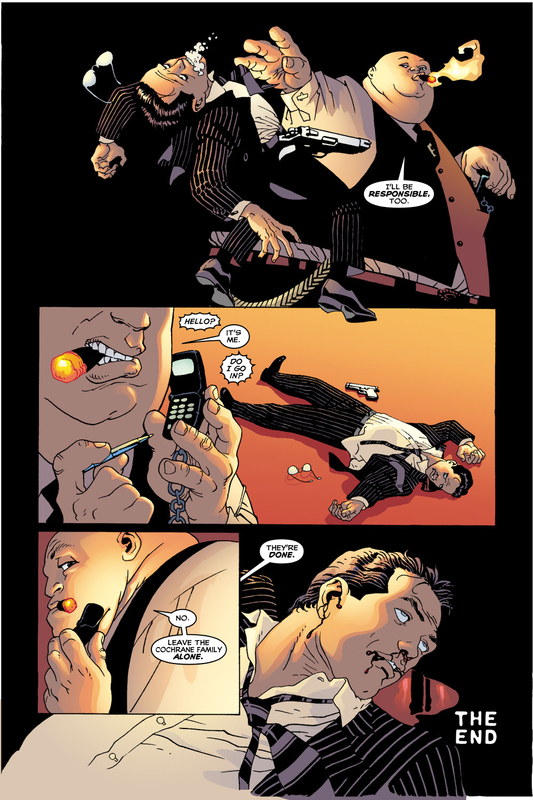 And to do it himself--well, all I can figure is Fisk needs to murder and maim people regularly or else he gets twitchy, because how many times can you pull this stunt and not have even the most incompetent or corrupt of authorities unable to turn a blind eye to it? That's the thing about powerful villains--they flat-out murder people regularly, and apparently they can cover it up perfectly, indefinitely, it seems. 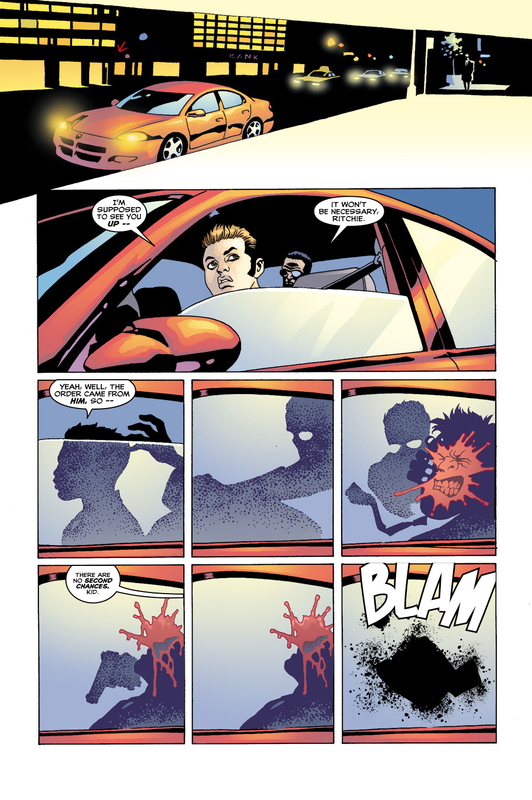 Comic book logic never works when you look too deeply into it. A comment on the Ronnie Kray (one of a pair of ultraviolent British gangster twins) was "Kray would manage to get away with this for three years by virtue of the fact that nobody was actually stupid enough to testify against a man who walked into pubs and shot people dead, this being a sort of tautological behavior. If you have the insane confidence needed to shoot someone in the head in front of numerous witnesses because you believe yourself to be untouchable, you also have the insane confidence needed to actually be untouchable. At least for a while." Of course, Ronnie Kray ended up sentenced to *so* much jail in the long run, and died in a psychiatric hospital, probably mostly because he didn't have writers who wanted to keep using him. Whitey Bulger (in Boston) did that too.